Seaford Town Council wishes to recognise the efforts of members of the community who demonstrate outstanding commitment to the well-being of Seaford. 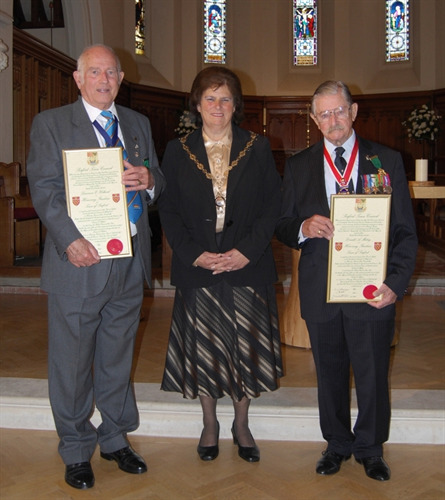 The first Honorary Freedom of the Town awards under Seaford Town Council were decided in May 2012 and were officially conferred on 30th September 2012 to Laurie Holland and the late Don Mabey MBE. Laurie Holland has a long-standing history of service to the town of Seaford. Initially through his work in the Treasurer's Department culminating as Treasurer to Seaford Urban District Council and Assistant Treasurer to Lewes District Council before his retirement. He later served as a councillor on both Lewes District Council and Seaford Town Council. Laurie is also very well known for his voluntary work in the town. He is President of both Seaford Lifeguards and Seaford Museum & Heritage Society. He has for many years undertaken key roles with Seaford Baptist Church, Sussex Table Tennis Association and is a keen member of Seaford Stamp Club amongst other things. Laurie is often described as "Mr Seaford". Don Mabey moved to Seaford in 1985 from Surrey. Don was a keen fundraiser for RAFA Charities, having raised tens of thousands of pounds over the years and was President of the Seahaven RAFA, a position he has held for many years. Anyone with any association to military events knew Don. He was a founder member and Honorary President of the Royal Society of St George Seahaven Branch, another charitable organisation in which Don and others raised money to support local good causes. In his spare time Don enjoyed his golfing and was a regular player and President of Seaford Head Golf Club. Don was awarded an MBE in the Queen's New Years Honours list in 2013. Sadly in December 2013, at the age of 94 years old Don passed away. 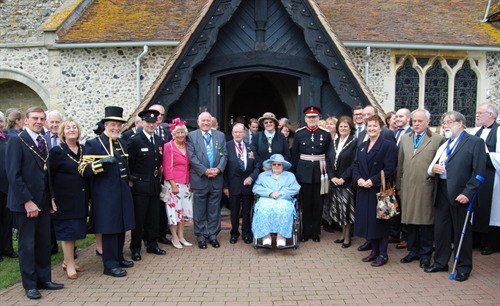 The First Freedom of the Town Ceremony for Seaford Town Council took place at St Leonard's Church, Seaford at the invitation of the Past Mayor of Seaford, Councillor Linda Wallraven. Following the service a short parade took place in Broad Street and High Street. Members of the public lined the streets to witness the celebration of this historic event. Picture: (L to R) Laurie Holland, Past Mayor of Seaford Councillor Linda Wallraven and Don Mabey MBE. Picture: The Freemen of the Town with local dignatories and attendees of the ceremont at St Leonards Church.